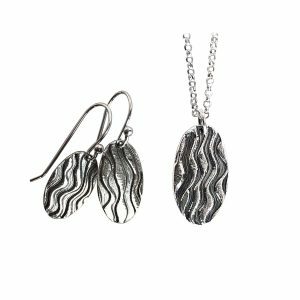 Delicate and lightweight , these beautifully textured leaves were created in fine silver just for you! Patina was added to bring out the delicate veins in the leaves. Pendant is 1/2″ wide by 1-1/4″ long. 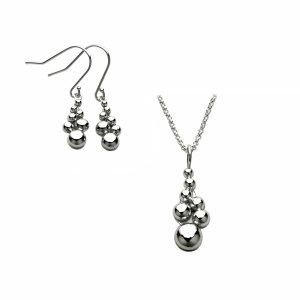 Sterling silver chain in your choice of four lengths. Earrings are 3/8″ wide by 7/8″ long. Sterling silver french ear wires.